Mirror Lake, Hubbard Brook LTER. Jane Sokolow. September 2017. One in three lakes throughout the US is polluted by excess nutrients like nitrogen and phosphorus, which often leads to algae growth and poor water quality.1 While nutrient cycling through the air and water are closely linked, fewer than 2% of monitoring sites in the US collect data for both air and water transport of nutrients. A team of researchers from the US EPA and other federal agencies wants to change this. 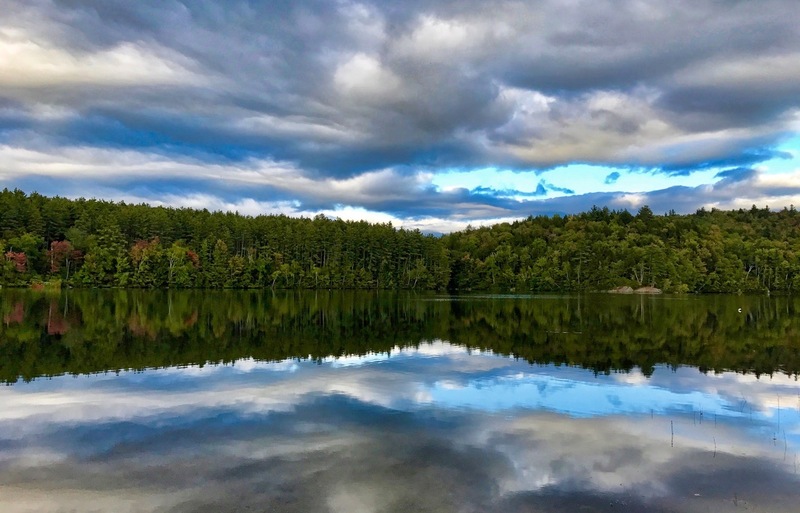 Using data from the Hubbard Brook and Coweeta LTER sites, where both atmospheric deposition and water quality monitoring occur, this research team showed the important relationship between air and water nutrient transport. Water quality monitoring alone is far more common for ecosystem management than atmospheric deposition monitoring, but this approach leaves a big part of the ecosystem picture missing. Anywhere between 5-60% of nitrogen inputs to coastal ecosystems come from atmospheric deposition. Urban areas, for example, have high rates of atmospheric deposition from traffic and other combustion activities that contribute up to 50% of nitrogen inputs to downstream waters. Researchers examined dissolved inorganic nitrogen stream exports and atmospheric nitrogen deposition both before and after deforestation at Hubbard Brook and Coweeta. Before deforestation, levels of nitrogen transported by air and water shifted proportionately to each other. 10 years after the trees were clear-cut at each site, the relationship between nitrogen transport in the air and water drastically changed, with higher levels of nitrogen transport in water compared to air. As the forest regrew at the Hubbard Brook LTER, the linear relationship recovered 40 years after harvest. At the Coweeta LTER site, where the majority of trees are nitrogen-fixers, nutrient fluxes did not recover after 40 years. This study shows the delicate balance and intricacies of nutrient cycles through the air and water, highlighting the importance of integrated monitoring. Building from these case studies, the research group identified four areas where connected air and water quality data could be especially important. Coastal zones and undeveloped watersheds are especially sensitive to nutrient inputs, while cities and agricultural areas serve as major sources of nutrient inputs to the atmosphere and waterways. Currently most atmospheric deposition data is collected regionally, which does not necessarily capture the nuanced data for these sensitive ecosystems and significant sources. This research team calls for the expansion of two programs already in place for collecting atmospheric deposition and air quality data, the National Atmospheric Deposition Program (NADP) and the Clean Air Status and Trends Network (CASTNET). The cost of implementing additional deposition monitoring sites is small compared to the amount of information it provides and the potential improvements to management decisions. Enhanced atmospheric deposition monitoring would allow for more rapid and effective responses to environmental changes such as an unexpected increase in air pollution from a fire or combustion source. Additionally, collocated air and water quality monitoring would help ecosystem managers determine if pollution in a water way is emerging from upstream waters or from atmospheric inputs. This data could also lead to significant advancements in nutrient cycling and pollution modeling, which would provide policy makers and managers with a better picture of how nutrients are actually moving throughout our ecosystems. 1 USEPA. National Lakes Assessment 2012; A Collaborative Survey of Lakes in the United States: Washington, DC, 2016. Amos, H.M., C.F. Miniat, J. Lynch, J. Compton, P.H. Templer, L.A. Sprague, D. Shaw, D. Burns, A. Rea, D. Whitfall, L. Myles, D. Gay, M. Nilles, J. Walker, A.K. Rose, J. Bales, J. Deacon, and R. Pouyat. 2018. What Goes Up Must Come Down: Integrating Air and Water Quality Monitoring for Nutrients. Environmental Science & Technology 52(20): pp 11441-11448.